I survived, as the t-shirt says.1 I did not buy a dress at the Running of the Brides, but I had a wonderful time, and I came to the realization that The Dress back in Pittsburgh had ruined me for all other dresses, so when I got back home I went ahead and bought it. So the RotB was a valuable experience, and I’m so glad I went. One thing I love about this sale, and a reason I’d recommend it to anyone shopping for a wedding dress, is that you can try on a LOT of dresses. 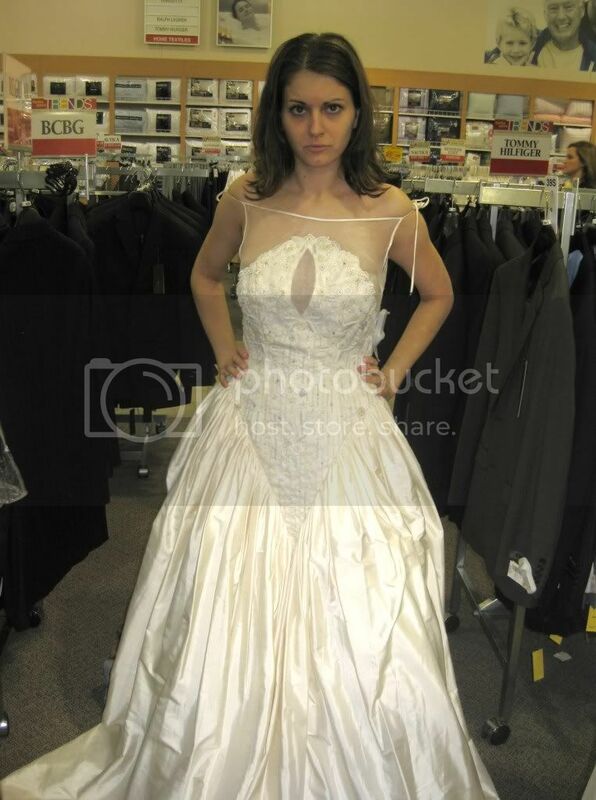 When I went to bridal salons I told them I wanted a slimmer silhouette, so they only brought out those dresses. Here, I could try on a a floufy gigantic dress, be reminded of why I don’t want one of those, jump out of it and into something else entirely. And it isn’t like you run out of appointment time. I was in love with this dress. I just didn’t want to wear it to my wedding. If I were having one of those daytime weddings in a park with “rustic festive” details, I would have bought this dress and skipped out of the store. Well, maybe I would have had a little pause because I think A-line skirts obliterate my figure (and people are always saying they’re universally flattering). Anyway, I didn’t want to buy this dress. But I wanted to find it a good home. I walked around the store in it, and other women kept saying, “What a cool dress! ?” And I’d say, “Do you want to try it on?” They’d immediately say, “It’s not for me.” And I’d sigh, ”It’s not for me either. 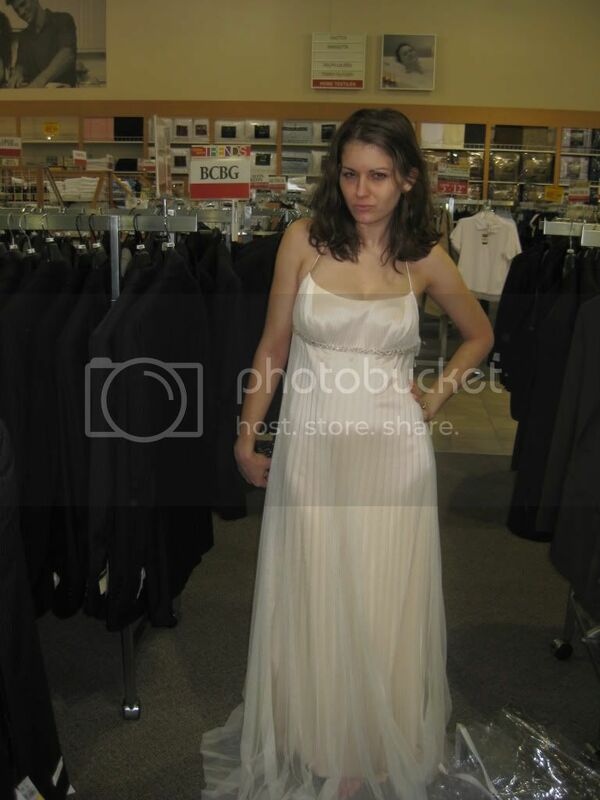 But someone NEEDS to buy this dress.” Eventually, some girl tracked me down, saying she had seen me in the dress across the store and wanted to try it. I stripped down pretty much immediately. She kept thanking me profusely, and I was like, “No, thank YOU!” She tried it on and it looked gorgeous on her, and the pink and green beading match her wedding colors, and while she didn’t immediately go buy it and was still undecided when we left, in my imagination she bought that dress and will think of me fondly when she gets dressed on her wedding day. This was another dress I thought was gorgeous but wrong for me. I can’t commit to the color red like that. If the swoopy gauzy part was gold or some color along those lines? If the skirt were more fitted? If the dress weren’t way too big on me? I would have been all over it. But the RotB is not a place for if-onlys. Note: when this picture was taken, I was cheering for someone who just found her dress. I believe this dress was made for a woman who grew up imagining she’d wear her mother’s wedding dress, but upon her engagement discovered to her dismay it had been thrown out during the last move/eaten by moths/destroyed in a fire/altered into non-recognition by a selfish little sister who just happens to be marrying the guy she’s in love with/never existed. Or maybe it actually is from the 1970s, and some Filene’s buyer found it under a pile of dust in a warehouse somewhere. 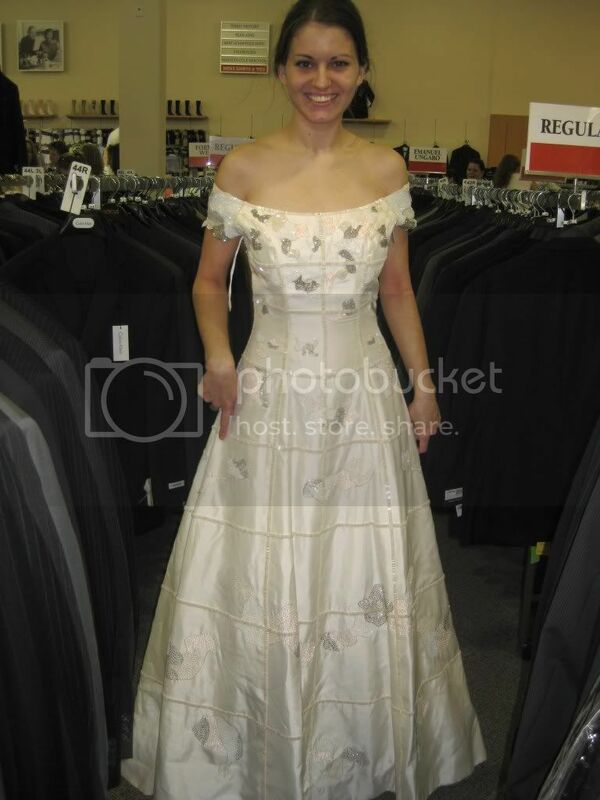 I tried on this dress because on the hanger I could not tell what it was supposed to look like. Putting it on my body did not clear up that confusion at all. Why this dress was designed is one of the great mysteries of our time. The mesh up top? The little strings around the shoulders? The waistline that plunged to about an inch above my knee? I think this dress might be a practical joke. And in case you cannot tell from the expression on my face: I am not amused. Not pictured: The Dress with Superfluous Zippers, The Dress With the V-Neck That Dipped Two Inches Below My Breasts, The Short Dress That Felt Like It Was Made of Ivory Denim. Also not pictured: the dress that I actually bought and am going to wear to my wedding (I’m trying to keep that bit secret from Collin). If you really want to see another picture of me, check me out in the Plain Dealer’s slide show! 1A note about the shirt: this year’s model reads “I survived…” on the front and “The Running of the Brides” on the back. The shirt is light pink. The words “I survived…” fall right on the bosom. From the front it really, really, really looks like a shirt about breast cancer. that last one is amazing. thanks for the wonderful pictures! Glad to share the wonder. So glad to hear it was a worthwhile experience. I was thinking about you. You definitely got some good pictures and I’m happy that you figured out The Dress was the one. I think it all sounds very productive all in all. Plus I have two years’ experience at the RotB so I can be an even better team member for my friends when they get married. Because I will be forcing them to go to this. I like that the last dress has that handy V pointing right to the vajajay, reminding everyone what the wedding night ritual is all about. The 1970s dress … I think they probably trot that one out every year for Running of the Brides, and have since 1977. The V actually dipped well below my V, so to speak. It really was only a bit above my knees. The effect was to make me look stumpy, even though I’m 5’8″ and change. Also, I wonder if some of the dresses they put on the racks really are there to add to the fun of the experience more so than they think they can sell them. This event was a bit more tame than the one I went to two years ago. I’m not sure why. But I only saw one moment of truly bad behavior, which involved yelling at a FB employee. Otherwise everyone was nice, there were always dresses on the racks (people weren’t hoarding dresses), everyone found their own little nook (I chose men’s suits because that is where Collin’s sister Carrie was camped out when she found her dress) and people were even sane about sharing mirrors! Also, I think there are women who could really pull off any of these with the possible exception of the last one. The unflattering nightie, for example, probably looks much better on someone with an hourglass figure, and the 1970s ghost bride dress would work great for someone who has a 70s aesthetic in her life and her wedding. Ok, in the comment you left about my sleeves saying how you tried on A LOT of dresses… I didn’t believe you until now. You are a good sport. 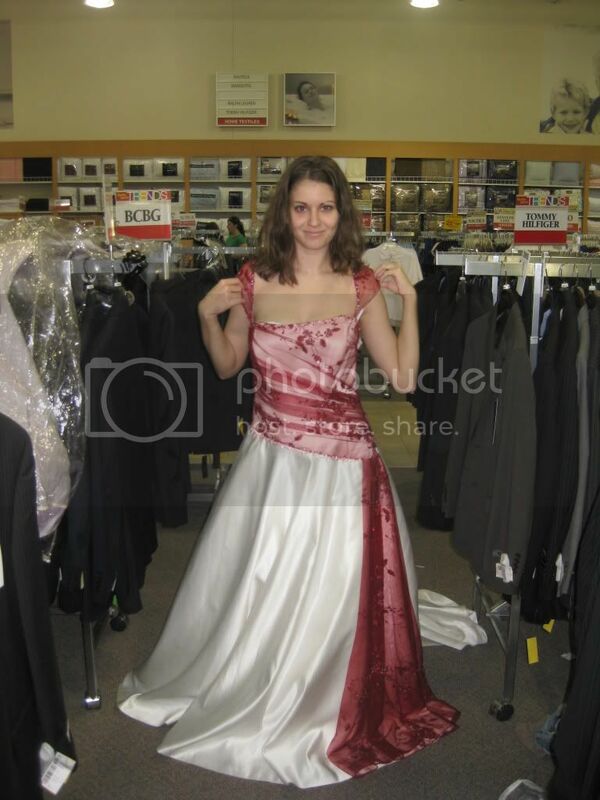 And that last dress? It truly is a great mystery. Your face in these pics are priceless. Yes. A lot. I tried on dozens more that were too boring to photograph or mention. I also saw hundreds more than that on the racks. None had sleeves as awesome as the ones on your dress. 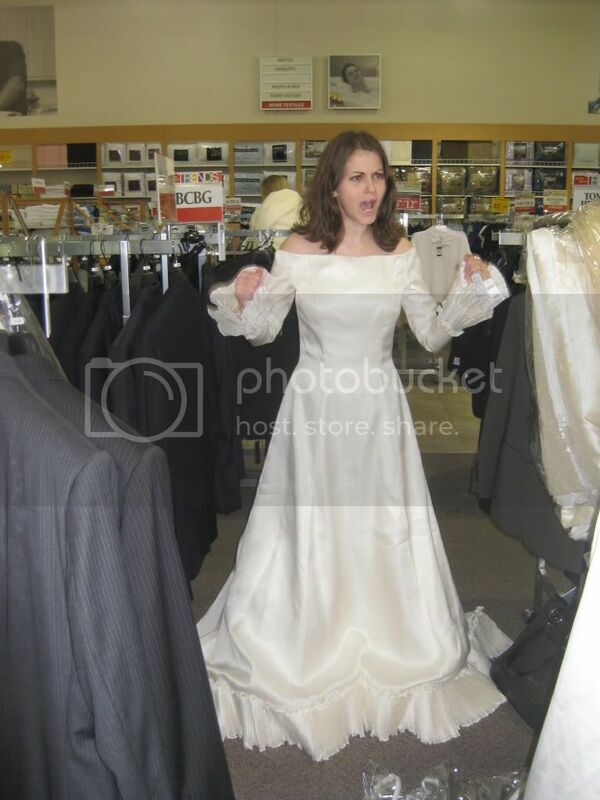 OH KICKASS THAT YOU BOUGHT YOUR DRESS! Thank you! It is really exciting. That last one is damn impressive. Oh my goodness, you just made my morning with these insane dresses. Also, YAAAAAAAY You bought the dress you love! HAHA!HAHA!HAHA!HAHA!HAHA!HAHA!HAHA!HAHA!HAHA!HAHA!HAHA!HAHA!HAHA!HAHA!HAHA! you are just so hysterical Robin!!!!!!!!!!!!!!!!!!!!!!!!!!HA!HAH!HAHAH!HAHAH!!!!!!!!!!!!!!!!!!!!!!!!!!!! That…. is awesome. Seriously. I love you. Thanks! It was a great event! Hope to be back as a helper in years to come.